In 2013, Americans drank more than 6.5 billion gallons of beer, which works out to about 27.6 gallons per person. That number has been in decline for some time, but it also can't tell you everything about beer in America. 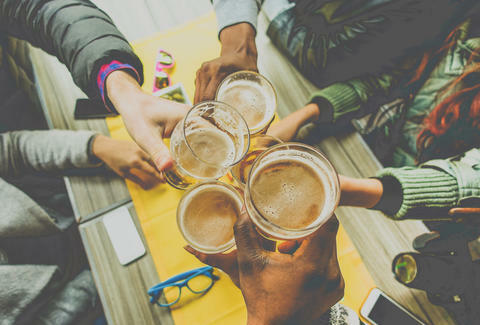 Craft beer has continued to increase its footprint in the States, and beer remains the most popular drink among Americans, according to data provided by 24/7 Wall St. It notes that 43% of Americans prefer beer, while 32% favor wine and 20% cite liquor as their go-to. Using numbers from Beer Marketer's Insights, 24/7 Wall St. put together data on shipments of beer per capita, a metric commonly used to indicate consumption. That data was compiled on a state-by-state basis to show which states imbibe the most. In 2017, breweries shipped about 26.4 gallons per person in the US. That average isn't representative of every state, with some consuming more than 40 gallons per person and others coming in around 18 gallons per person. Visual Capitalist distilled these numbers into this easy-to-read map. The bulk of the states with the highest beer intake reside in the Upper Midwest and Montana. Though, there are exceptions. New Hampshire takes the top spot. Its ranking is likely influenced by its non-existent alcohol tax. The state's liquor commission estimates that up to half of New Hampshire's alcohol sales might be purchased by residents of neighboring states looking to save money, reports Food & Wine. Other states may have their rank influenced by similar situations. Up until July 2017, Minnesota didn't allow liquor sales on Sundays, which undoubtedly drove Sunday sales in neighboring states. At the other end of the spectrum, Utah consumes the least alcohol at 18.7 gallons per person. There are a number of factors that influence its ranking, including the high number of Mormons, many of which abstain from alcohol consumption entirely. Additionally, liquor laws in the state are atypical. Some areas sell beer at 4.0% ABV, there are restrictions on alcohol consumption in restaurants, high alcohol taxes, and the sixth lowest number of bars and restaurants per capita in the nation. Here's a look at the states that consume the most and least beer per capita. States with the highest consumption levels. States with the lowest consumption levels.